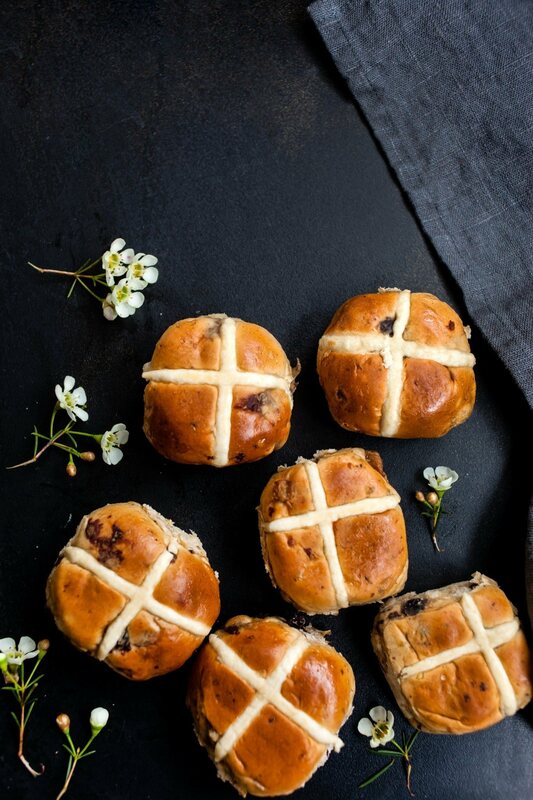 It’s almost Easter, the perfect time to indulge in hot cross buns, jam-packed with currants, raisins and warming spices! The hot cross bun is traditionally eaten on Good Friday in the British Isles, Australia, New Zealand, South Africa, Canada, and India. The buns mark the end of Lent and different parts of the hot cross bun have a certain meaning, including the cross representing the crucifixion of Jesus, and the spices inside signifying the spices used to embalm him at his burial. We’ve picked our go to Hot Cross Bun recipe so you can make your own this year. Happy Easter! – Place the yeast, 2 teaspoons sugar and the milk in a large bowl and set aside for 5 minutes. The mixture will start to foam, indicating that the yeast is active. – Next, add the flour, mixed spice, cinnamon, butter, egg, sultanas, mixed peel and remaining sugar to the yeast mixture and mix until a sticky dough forms. – Knead the dough on a lightly floured surface for 8 minutes or until elastic. – Place in a lightly oiled bowl, cover with a clean, damp cloth and set aside in a warm place for 1 hour or until doubled in size. – Divide the dough into 12 pieces and roll into balls. Arrange the dough balls in a lightly greased 22cm square cake tin lined with non-stick baking paper. – Cover with a damp cloth and set aside in a warm place for 30 minutes or until risen. Preheat oven to 200°C (400°F). – For the crosses, add the water and flour to a bowl and stir to combine. Place in a piping bag or a plastic bag with one corner snipped off, and pipe crosses on the buns. – Bake buns for 30–35 minutes or until golden and springy to touch. – While the hot cross buns are baking, make the glaze. – Place the water in a small bowl and sprinkle over the gelatine. – Set aside for 1–2 minutes or until the gelatine is dissolved. Set aside. – Add the gelatin mixture and cook for 1–2 minutes or until the gelatin is dissolved. – Brush with the warm glaze while the buns are still hot.